Entertainment Media is perhaps the most influential mode of propagating information aimed at enriching the human mind. Today, the market of CD-ROMs, being the fastest developing and the most popular one, has become the first choice for the new generation. Following the trends and adhering to the market oriented strategy, Aatman Innovations Pvt. Ltd. has developed a wide range of multimedia interactive CD-ROMs, in order to emanate the flame of true knowledge blended with entertainment among all human beings. The entire product line represents the talent of our super efficient creative team. It’s their spirit blended with creative insights that have produced unique CD-ROMs. Mastering all dimensions, we have produced over 100 CD-ROMs on almost all subjects pertaining to life. The company has worked upon various products starting from great religious and psychological books, granthas to psychologies and biographies and many more. The CD-ROM’s market for children also holds a great potential in itself. Hence, Aatman Innovations Pvt. Ltd. has developed a vast range of CD-ROMs for children starting from games, puzzles, works for psychological development, serials, anecdotes and many more. The advent of audio-visual media has revolutionized the way knowledge is derived, giving a much greater exposure to people at large. In order to accelerate learning with sketches and animation as audio visual aids, using the potential of this medium we have launched a range of DVDs on Krishna, Gayatri mantra Discourses and a list of TV Softwares to all the aspects that we cover. 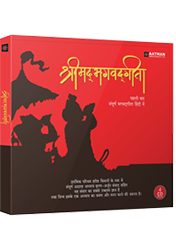 A set of 4 CDs encompassing the 18 chapters of the Bhagavad Gita with the preliminary introduction in the magical voice of Harish Bhimani. Sung by Krishna Bhutani, Vishnu Sharma and Arvind Mehra and set to music by the late Shri Shambhu Sen. Buy NOW ! 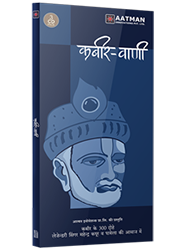 A compilation of 300 couplets in a set of 3 CDs, which are the spontaneous expressions of Kabir's vision and his love which directly appeals to the heart. The enriching and enchanting couplets, set in the voice of legendary singer Mahendra Kapoor and Pamela, invoke mystical emotions. Buy NOW ! An audio CD that both invokes and explains the Gayatri Mantra, the oldest and most powerful of all Sanskrit mantras, sung by a host of accomplished singers like Manna Dey, Kavita Suresh Wadkar, Krishnamurthy, Manhar Udhas, Mahendra Kapoor etc. to name a few. The lyrics are by Shyam Anuragi and music is composed by late Shri Shambhu Sen. Buy NOW ! WHAT IS THE ROADMAP OF YOUR LIFE? In this DeepTalks session, Mr. Deep Trivedi discusses how it is easy for a man to achieve Joy and Success, if he selects the path of his life correctly. Buy NOW ! In this DeepTalks session, Mr. Deep Trivedi discusses how it is easy for a man to achieve Joy and Success, if he selects the path of his life correctly... Buy NOW ! HOW CAN WE BREAK OUT OF ‘DAY-SLEEP’? In this DeepTalks session, Mr. Deep Trivedi discusses how ‘Day-sleep’ in human beings is much deeper than night sleep and breaking out of it is of utmost importance. Buy NOW ! HOW DO WE RECOGNISE THE DIFFERENCE BETWEEN THE MIND AND THE BRAIN? In this DeepTalks session, Mr. Deep Trivedi discusses that the mind and the brain not only have different existences, but how their area of functioning is also extremely different. Buy NOW ! In this DeepTalks session, Mr. Deep Trivedi discusses that there is not one, but seven states of mind within a human being, and all of them have their own psychology. Buy NOW ! WHAT IS THE REASON BEHIND A HUMAN BEING’S LIFE BEING SO UNSUCCESSFUL? In this DeepTalks session, Mr. Deep Trivedi discusses that the reason why human beings are so unsuccessful today is because they do not have any knowledge about psychology. Buy NOW ! In this DeepTalks session, Mr. Deep Trivedi discusses that it is the path which is replete with psychological knowledge that strengthens the human mind and this in turn will lead man onto the path of Joy and Success. Buy NOW ! In this DeepTalks session, Mr. Deep Trivedi discusses that it is due to the absence of a true personality that human life is surrounded by innumerable pains, sorrows and failures. Buy NOW ! In this DeepTalks session, Mr. Deep Trivedi discusses how Complex cannot be eradicated from life, until and unless you understand its psychology. Buy NOW !